We are welcoming June in our new offices! It's been an eventful, challenging, topsy-turvy time for us. One of the often overlooked benefits of moving is that it gives you the chance to clean out the clutter, go into the corners and crevices and dust off what is no longer needed, see what you've outgrown, find memory moments and aha's, and provides a chance to reenvision what you want to bring into your life. Here's a shout out to the D'Adamo Personalized Nutrition staff, who have worked through the transition, and who are working in space currently that is about 85% completed. We have drop cloths on file cabinets, doorframes which need to be painted, a warehouse door to be installed. Through it all, I've heard upbeat conversations, laughter, and the spirit of adventure, and these qualities have always been the hallmark of what has made us such a great company. We are small, we are dedicated, and we strive for excellence in all that we do. Through it all, I keep coming back to two underlying concepts -- reinvigoration and reinvention – and how vitally important it is for each of us to take time to assess our lives, and reflect on where we are so that we stay fresh. Changes, whether a move, a new month, a relocation, a new inner attitude, provides the canvas for us to give new life to and energize (reinvigorate) our lives, and then consciously imagine (reinvision) what we want to bring into our lives. As we draw near to the mid-year mark, June seems like a great month to do this. Take a look at your new year's resolutions—totally forgotten? Achieved all of them? Half-heartedly plugging along? Use the month of June to recommit to your goals and desires and to strive for personal excellence. Here's to reinvigoration and reinvention! Everyone can benefit from following the Blood Type Diet. For individuals who are challenged with blood sugar issues, the personalized nutrition and lifestyle guidelines of the Blood Type Diet provide additional support for healthy blood sugar maintenance and regulation. 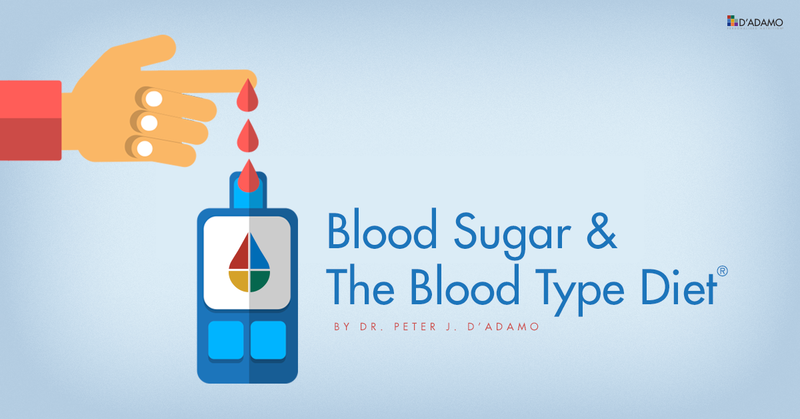 Let's quickly review some fundamentals of blood sugar maintenance. The hormone insulin produced in the pancreas, moves sugar out of the bloodstream and into cells. If there's more sugar in the bloodstream than the body needs right away, the extra is stored as fat. Normally, the presence of too much sugar in the blood signals the pancreas to release insulin, and lowered blood sugar levels makes insulin production stop. Low blood sugar, or hypoglycemia, occurs when there's too much insulin for the amount of sugar. This can happen from eating a high sugar, low fat, low protein meal that releases a lot of sugar quickly. Then no more energy is released while insulin levels are still high. Eating a diet that's right for your type can help keep blood sugars in a healthy range. Type 1 Diabetes occurs when the pancreas stops producing insulin. Insulin shots will be needed for life, and following the right diet provides additional support and helps prevent complications. Type 2 Diabetes occurs when the pancreas still makes insulin, but the insulin isn't working as well as it should. This can be managed via diet, but sometimes medications are also needed. Gestational diabetes is when blood sugar gets too high during pregnancy. It usually clears up after delivery, but it raises the risk for Type 2 Diabetes later in life. People with diabetes often have high cholesterol and/or high triglycerides. Your body uses cholesterol to build cell walls and to produce certain vitamins and minerals. Triglycerides are used as stored fat that keeps you warm, protects organs, and provides energy reserves. When these fats are out of control, they collect and harden into arterial plaque, which blocks the flow of blood to the heart. Uncontrolled high blood sugar can cause many complications, involving the kidneys, blood vessel, and nerves. Many people with Type II Diabetes or pre-diabetes also have high cortisol levels and excess body fat. Cortisol is a stress hormone, and among other things, it causes blood sugar to go up. This is useful in the "fight or flight" reaction- giving our ancestors the energy to escape from predators. But, chronic high cortisol interferes with another hormone called leptin. Leptin acts on the hypothalamus to regulate the extent of body fat, the ability to burn fat for energy, and satiety (the state of being completely full). A vicious cycle follows as excess body fat encourages cortisol production, which can then lead to high blood sugar levels, high blood pressure, and other health problems associated with obesity. People with Blood Types A and AB lack the enzymes to digest high fat and high protein meals. Over consumption of fatty foods increases the cardiovascular risks for diabetics. Blood Types Os and Bs lack the ability to digest high carbohydrate meals and are prone to high triglycerides and high blood pressure. Both Blood Types As and Bs have higher natural levels of cortisol, and need to work on stress management as part of their healthy lifestyle. Some foods contain proteins called lectins – abundant and diverse proteins found in foods – which can agglutinate or clump your blood. Lectins are highly blood type specific, making them good for some people while toxic to others. Some lectins, particularly those found in many common grains, can wreak havoc on the body's fat cells by binding to their insulin receptors. The Blood Type Diet is designed to be low in harmful lectins, and to emphasize the foods that are easier for your body to digest and limits the foods that are harder on your body. For many diabetics and pre-diabetics, weight loss and management is an important health goal. Following the Blood Type Diet can encourage weight loss and blood sugar stability. For more information, including a complete listing of foods for each blood type, you can refer to my books DIABETES: Fight It with the Blood Type Diet, and The Complete Blood Type Encyclopedia. A complete listing of the foods for the Blood Type Diet can also be found on the Type Base. 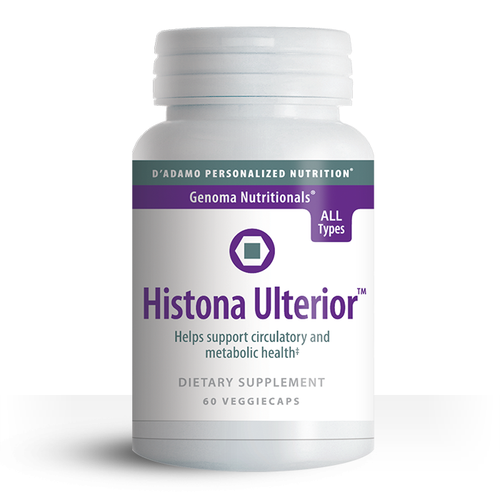 In addition to following the personalized diet and exercise guidelines for your Blood Type Diet, Dr. D'Adamo has formulated a unique series of products that help to maintain blood sugar levels already in the normal range, support healthy energy levels, and block the negative consequential harmful lectins. 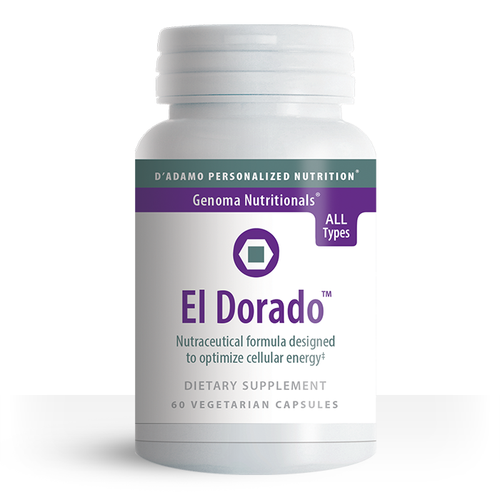 Dr. Peter D'Adamo formulated El Dorado, a unique formula designed to support the healthy function of AMPK. He has found that patients on the El Dorado protocol show healthy blood sugar regulation, an increase in muscle mass, normalized cellular energy production, and a metabolism working at optimal levels, especially when combined with proper diet and exercise. Maintaining healthy function of AMPK also improves many of the cellular systems involved in waste removal. This has important significance with regard to anti-aging, as the accumulation of cellular waste products is a well-recognized sign of the aging process. An innovative, one-of-a-kind nutriceutical formula designed by Dr. Peter D'Adamo as an aid to weight loss, the maintenance of blood sugar levels already in the normal range, and the overall enhancement of a healthy metabolism. 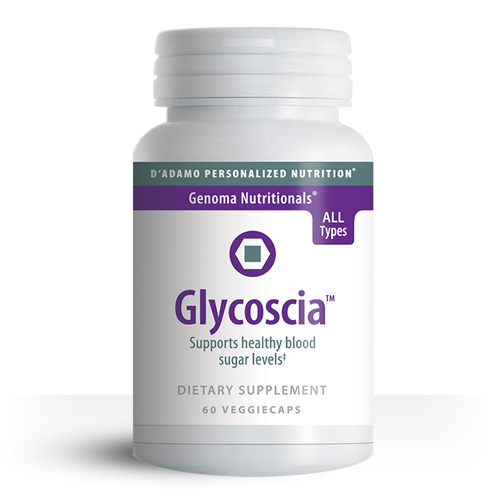 Originally developed for use in his clinic, the key ingredient in Glycoscia is the Ayurvedic herb, Salacia oblogna, a traditional herb that has been used for thousands of years in Ayurvedic medicine, in addition to four other synergistic co-factors. 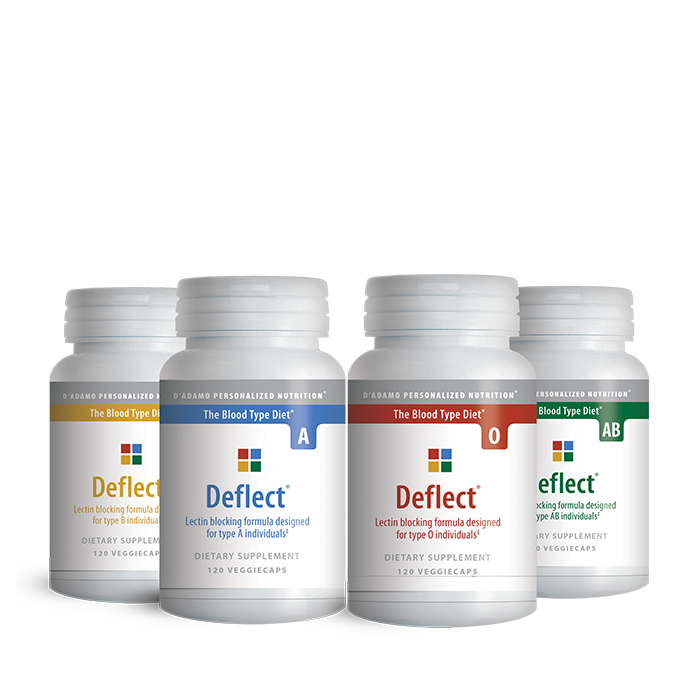 One of Dr. D'Adamo's most popular and foundational formulas, Deflect has a wide range of applications, including supporting weight loss, enhancing metabolism, and aiding in maintaining the integrity of the digestive system. Deflect is designed to block problematic dietary lectins, which are ABO blood type specific and can wreak havoc in the gut and on the immune system. There are four Deflect formulas, one for each blood type. Type O: N-Acetyl D-Glucosamine, Bladderwrack, Larch Arabinogalactan. Type A: Chondroitin Sulfate, D-Mannose, Cranberry Concentrate. Type B: Larch Arabinogalactan, Pectin (citrus), N-Acetyl Cysteine. Type AB: Larch Arabinogalactan, Cranberry and Pineapple Concentrate, D-Mannose. The Individualized Plan for Preventing and Treating Diabetes (Type 1, Type 2) and Prediabetes, Including Hyperglycemia (high blood sugar) and Hypoglycemia (low blood sugar). Condition-specific tools for preventing and treating diabetes and prediabetes that are not available in any of Dr. D'Adamo's other books. A diet tailored to your blood type that helps you prevent or treat these conditions. Finally, Diabetes includes a four-week plan for getting started that offers practical strategies for eating, exercising, and living right to prevent, fight, and treat diabetes and pre-diabetes conditions. 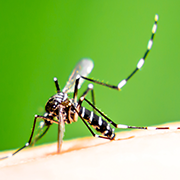 Until then, keep covered and alert, and use natural repellents that contain citronella, lemon eucalyptus, rosemary, lemongrass, or cedarwood oil. Awareness and Blood Donor Day. Encouraging individuals to donate blood. It's an act of kindness and support for someone who might need it. Find out more here. 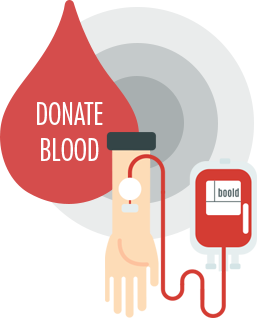 If making a blood donation doesn't work for you, we offer an easy to use home blood typing kit so that you can find out your blood type.